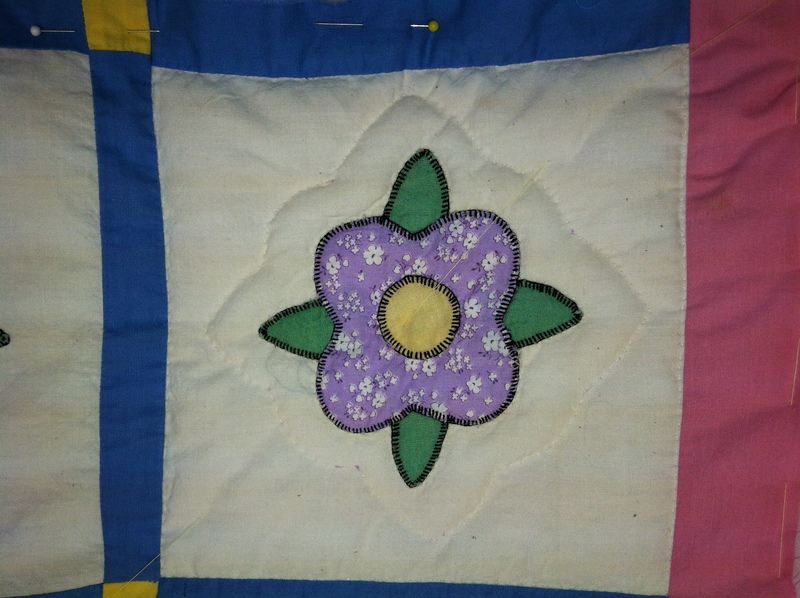 We move forward on the quilt that was pieced by Alice’s grandmother. At times we discuss whether the flower pattern is a primrose or modeled after some other type of real flower. Or perhaps it is a pattern that the original quilter thought was pleasing to the eye and isn’t based on an actual flower at all. We do enjoy quilting it. I suspect that people who don’t quilt would see making very small stitches for hours at a time as boring. They might think stitching would be the same regardless of the quilt. But that’s not the case. I say this not because of my own novice level of quilting but by the remarks made by the other women. 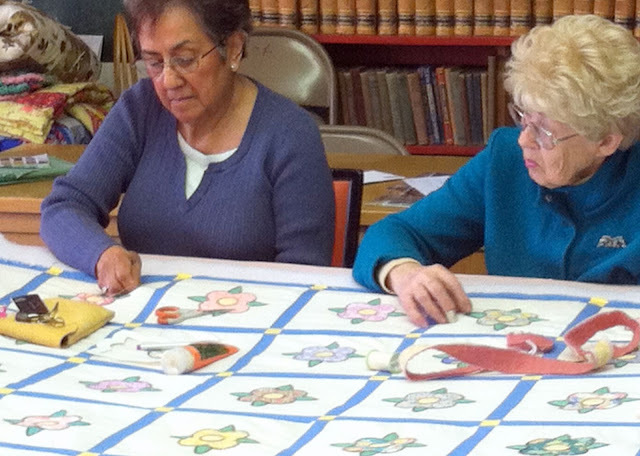 This quilt with the flower pattern which we “shadow” only requires us to sew through three layers of fabric. In most quilting we sew through the three layers (the back, the fill and the top). But if we are quilting along seams or where fabrics on the top were pieced together, we might be sewing through two additional layers. This makes it difficult for me as a quilter who is new to this trade but even the more experienced quilters lament at times struggling to keep the sticks small through all those layers. Alice’s grandmother’s quilt though is easy so the talk among the quilters rises and falls. Often someone remarks when there is a quiet lull, “It must be twenty after” because that is the time when we are quiet. This was some sort of tradition that existed before I started quilting with the group and I don’t know how it got started. It is peaceful to sit there listening to the stitches and enjoying the quiet company of these women. When we are talking though – it can be on any number of subjects! Friday’s topics included the high school play, the newly elected Pope, Joan’s recipe for Drunken Chicken, Cathy’s husband returning home after his work abroad for the past two months, and how to set a head stone properly. The wonder of this group is that regardless of the topic, I can tell the others are listening and any remarks made are supportive. I wonder if perhaps politicians should meet around a quilting frame rather than in fancy offices or in hallowed halls. On one of our Fridays, Bev wore a necklace that she told us was made of rose beads. I had never heard of these before but Cathryn said she would give me a recipe. I have to pass it on to you as I don’t have rose bushes in my yard. Gather roses on a clear morning after the dew has left them. Choose those with the sweetest fragrance. Pick them at their peak before they begin to fade. Carefully pull off petals, discarding seeds, stems and leaves. If necessary, gently roll petals in a towel to take up any moisture. Put petals through a food chopper 3-4 times using the finest blade. Place in an iron skillet (you must use iron to turn petals black). Cover and refrigerate for 24 hours stirring occasionally to get even blackening. Run the petals through the food chopper again 3-4 times. Use at once or store in a covered container in the refrigerator (may keep up to two weeks). To make the beads: work in gloves to avoid staining hands. Take up generous 1/4 teaspoon of pulp. Place in palm of hand. Knead and pack into a smooth round shape. It is best to make 2-3 dozen beads at a time. Keep rest of mixture in refrigerator. Make the beads as uniform as possible. Expect shrinkage of 2/3 to 1/2 original size. Let stand at room temperature for 24 hours. Then run a darning needle through to make holes. If desired put decorative marks with point of scissors. After another day or two, run string through. Let stand until completely dry which takes about a week. To maintain fragrance, keep in airtight container. One dozen roses will give approximately one quart of rose petals and 1/4-1/3 cup of pulp.